bebop spoken here: Roly Veitch and the Paul Edis Trio @ St Cuthberts Church Hall, Crook, April 27. 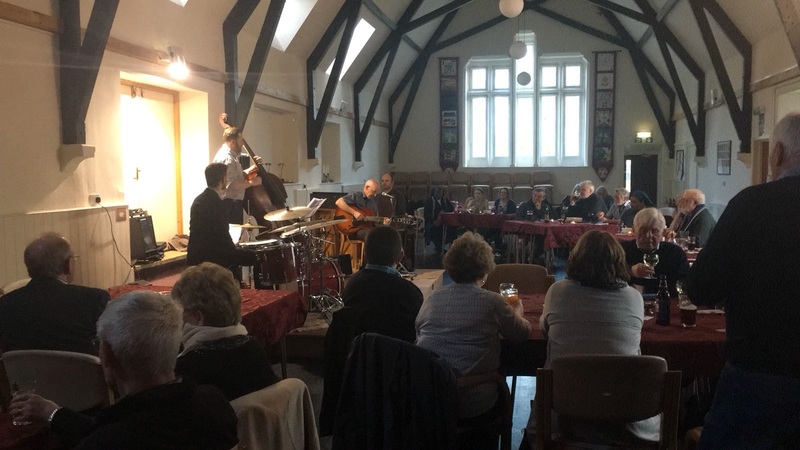 Roly Veitch and the Paul Edis Trio @ St Cuthberts Church Hall, Crook, April 27. Roly Veitch (guitar, vocal), Paul Edis (piano, flute, clarinet, vocal), Andy Champion (double bass), Adam Sinclair (drums). Three cuts in, Master Eales asked if I was reviewing it and I responded that somebody would have to. Astonishingly, this was the first time I've ever seen Roly Veitch, who I've been aware of since I arrived on the North East Jazz Scene a few years back. It's no secret that I normally like Jazz guitarists to rock it up, but there was no suggestion of that here, and I wasn't at all disappointed. He's a fine player: clean, uncluttered, little flash, plenty of space and totally unselfish; with musicians of this calibre, why would you be?! Rosetta and Flamingo were followed by It’s Only a Paper Moon and, as I returned from the bar, I explored the stage to see who was singing - for a split second, thinking it might even be taped - before realising it was the man with his back to me, Paul Edis. A very clear voice, good pitch, not remotely from the soulful tradition of my own background, but more music-hall, perhaps even a bit choir-boy. I later asked him if he was the last person picked for sports teams at school and the reader will be pleased to know he was. He then took the lead on flute through Edelweiss; a wonderful song and ideal for a church hall with a couple of nuns present. Paul would return to the flute, play clarinet and give us another song before the night was done. The latter was a Jambone original - It Takes Time - with lyrics written especially, and intelligent lyrics too. The region has long benefitted from a number of fine lady singers but an absence of men. Or so I thought, as it seemed Roly is up for a bit of singing himself. He's not half bad either, though I doubt the Sinatra estate will feel threatened. More singing guitarist, but Fred Astaire was a singing dancer. The set was more or less standards, though nothing you hear too much of: Dear Bix, Love Walked In, You're a Lucky Guy, Alone Together, Sometime Ago, Lotus Blossom, Darn That Dream and ending with Cottontail. It's a great night out; as the sun goes down and successive ales run out, there's crisps and nuts, pizza and a raffle during the interval. The hosts, the Timothys, immortalised in a 'tune' by one of their various sons-in-law - Lord Paul - are genuinely wonderful people. And I know Roly will forgive me for observing tonight left some space to watch.